This event was a birthday event for the minor idol/seiyuu Hibiki Mion. There were several guests for this event, and one of them was Maru Maru Gakuen Housoubu. This was my first time going to Kanda K Hall, and it was a very small hall. It was actually just a pretty bare basement of an office building, with a small stage (about 50 cm high) at one end. The stage wasn't very wide, as the nine Maru Gaku girls had to squeeze in to fit across the stage. The dressing room was also very small, just a small space behind a door on the side of the hall. It probably wasn't big enough for all of the Maru Gaku members. So most of the Maru Gaku members and other guests stood along the wall, and watched the event when they weren't on the stage. There were around 20 people in the crowd. At the beginning of the event, Hibiki Mion came out and sang Totoro. Then Maru Gaku was the first guest. The Maru Gaku girls wore matching tank tops (with candies one it) and a white, long sleeve sweatshirt with a zipper down the front. They all wore checkered mini skirts and long black socks (over the knee). The Maru Gaku songs were as follows. Saori, Kanako, Kana, Miki sang "Namida Surprise" (AKB48). Nao, Tomoko, Yuki, Haruka, Megumi sang "Heart no Ace ga Detekonai" (Candies). Chelsea (Saori, Kanako, Yuki) sang "Magic Girl". Nao, Kana, Megumi, Miki, Nao, Haruka, Tomoko sang "Mizonokuchi Taiyouzoku". All nine girls sang "Morning Coffee" (Morning Musume). They mixed some talk in between the songs, and the Maru Gaku stage was around 30 minutes. 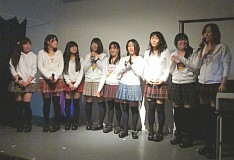 After their stage, the Maru Gaku girls emceed the event. There were three other guests, and the final performer was Mion. But before Mion sang her songs, there was a talk corner with Mion and the Maru Gaku girls (Saori, Kana, Kanako). They talked about some of the comments that Mion made on her blog. After several songs by Mion, there was a happy birthday cake celebration at the end of the event. After the event, the performers set up tables and sold some goods. I didn't know if photos were allowed, so I only brought my compact camera (Powershot S90). It turned out everything (photos, videos) was allowed. I ended up taking around 100 photos, with around 40 worth keeping, and videos of all the Maru Gaku songs. But it was very dark with bad lighting, so the photos weren't very good.